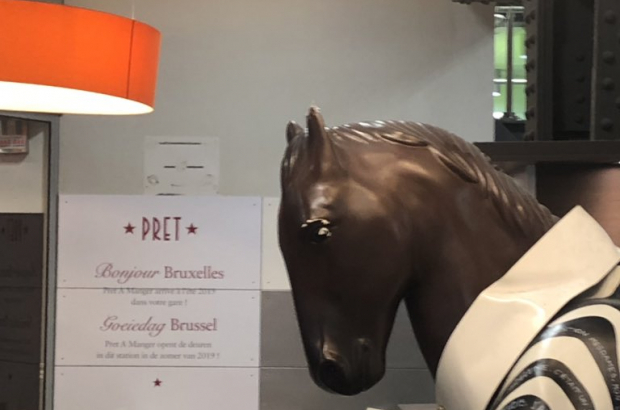 British sandwich chain Prêt à Manger's arrival in Brussels has claimed a casualty - a plastic horse dressed up as a zebra in Brussels Midi station, called Sam. Regular users of the Eurostar and Thalys terminals at Midi station will be familiar with Sam, who has watched over customers at a cafe bearing his name on the station concourse. "Every train journey I’ve taken from Midi in over a decade has started with meeting next to Sam for a coffee/beer," Rebecca Shorrock said on Twitter. "Please keep him." Sam's cafe is making way for Prêt à Manger - one of the chain's first Brussels outlets, alongside Central Station. Despite earlier reassurances to the contrary, it appears Sam will be removed in May, with Financial Times Brussels reporter Jim Brunsden breaking the bad news on Twitter this week. Méabh Maguire described Sam as "a national treasure - or at least a very helpful landmark". She wrote: "Brussels folk love Sam the zebra-horse. He's weird and wonderful just like this city. Don't get rid of him." Venetia Spencer added: "Please don’t retire Sam. He’s been making me smile and buy a coffee ever since I first got off a Eurostar to live here in Brussels - 14 years and counting." Sam has even played an important match-making role. Simon O'Connor wrote: "When Marta came to visit me in Brussels after not seeing each other for 12 years, we met by Sam, the horse disguised as a zebra. Sam brought us luck: we got married 10 months later." Pret à Manager confirmed: "The reports are true. We're working with our partners in Brussels to make sure he's rehomed somewhere safe." The sandwich brand, which has 530 points of sale in nine countries, will launch in Brussels as a franchise operated by SSP, which has about 40 outlets in the country under the Panos, Coffee Club and Deliway brands. Hippocide, that’s what it is. What has Sam ever done to Pret? When my husband first came to Brussels nearly 6 years ago, and I came to visit him, we used to rendezvous by Sam. When I came to live in Brussels I still used Sam as a beacon for friends coming to visit. Isn’t it typical though of large companies saying what you want to hear. Once they are in, they renage on their promises. I will boycott Pret, now and in the future, even when I am back in London. I hope all equine lovers will dothe same. Save Sam! As a Sam, I am totally outraged by this removal of my namesake. I kindly inform Prêt that I expect this nobly named steed to stay exactly where it is. If not, expect some peaceful yet constant civic protest starting with a boycott. Sam was and is basically the only attractive thing greeting Eurostar and Thalys arrivals in Brussels South. It's like removing the Statue of Liberty in NY because they're going to put a Prêt on that spot. I lament the recent demise of so many independent cafés and bars in the Brussels metro and train stations, to be replaced by soulless chains such as Paul, Starbucks et al. This is just another example of Brussels' unique personality being erased in favour of huge dominating multinationals.